Two Woody Allen movies debuted on Blu-ray last month, both courtesy of boutique label Twilight Time. 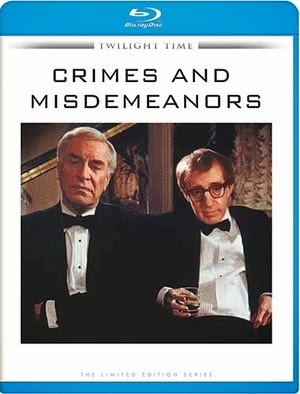 One is often cited a classic Allen, the 1989 Crimes and Misdemeanors (nominated for three Academy Awards, including Best Director and Best Original Screenplay). The other isn’t a Woody Allen movie per se, at least not as they are usually perceived (i.e. written and directed by). In 1976, Allen made the then-unprecedented move to star in a movie he neither wrote nor directed. The Front was directed by Martin Ritt and written by Walter Bernstein (who received an Oscar nomination for this). Our focus here is the 1989 film. I rarely disagree with the general consensus when it comes to Woody Allen’s best regarded films, but Crimes and Misdemeanors is an exception. Two very different and barely-related stories were crammed together. If they complement each other, it’s only because Allen says they do. One is fairly typical Allen fare, and it’s the better of the pair. Allen plays Cliff, a lowly documentary filmmaker who takes a commercially-oriented job he considers beneath him. He needs the money and the subject is his wife’s brother, Lester (Alan Alda), a pompous TV writer. The producer of the film, Halley (Mia Farrow), is interested in Cliff’s independent passion project (a doc about a aged philosopher) and the two become more closely involved. Of course being married, Cliff isn’t readily available for a long-term commitment. Complicating things further, the charismatic Lester proves to be an attractive alternative for Halley. All of this is fine, if under-developed, Allen material. The problems occur every time we see the other half of the film – involving Martin Landau as ophthalmologist Judah. He’s also a married man engaged in an affair, deeply involved with flight attendant Dolores (Anjelica Huston). He’s morally compromised individual who seeks guidance from a patient who happens to be a rabbi (Sam Waterston) – and who happens to be going blind (conveniently, as it provides too-obvious symbolism). Dolores has some potentially career-ruining dirt on Judah (involving shady business deals) and he doesn’t know how to extract himself from the situation. This portion of Crimes is very stilted and unconvincingly acted (not the actors’ fault, Allen saddled them with unnatural dialogue). Coming at the end of a fruitful decade for Allen, one which saw the highs of Zelig, Broadway Danny Rose, and Hannah and Her Sisters (a career best), Crimes and Misdemeanors is a puzzlingly overrated film. There are good ideas here, with cues taken from Dostoyevsky’s Crime and Punishment, but they don’t come together to form a cohesive, satisfying whole. Still, as a Woody Allen fan and collector, I’m glad to have this on Blu-ray. It’s especially worth upgrading since the presentation is significantly better than the old standard DVD edition. Swedish cinematographer Sven Nykvist (famous for his work with Ingmar Bergman) shot this and his warm, golden-hued photography looks terrific. Aside from a few very minor and infrequent specs of print debris, this is an excellent transfer. The DTS-HD MA mono mix is rock solid. There’s not much of interest from a purely sonic perspective (what else is new for an Allen movie? ), but the dialogue is clean and clear in this lossless presentation. I had hoped for one of the new Twilight Time commentaries that have been popping up on their recent releases, but alas it was not to be. I’m guessing this is down to the fact that Woody Allen does not do commentaries on his movies and probably had a mandate that no one else will either. We do get a music-and-effects track. There’s also a standard definition theatrical trailer. We’ll take a look at The Front (which DOES include an outstanding audio commentary) shortly in a separate review. Both titles are strictly limited to 3,000 copies and are unavailable once supplies are exhausted. Head over to Screen Archives for ordering information.